I could give a more specific answer if you had provided more information. Were you using our MMA system, or the Quick Glaze process? What filler was used? What steps did you take prior to seeing the wrinkling? Did you follow our procedures? So, I will try to explain all of the potential causes. If you were using the Quick Glaze system, it could occur during the spraying operation. The Base Coat is first sprayed on the surface, and it contains a hardener that cures the coating. The Clear Coat needs to be applied before the Base Coat is completely cured. Otherwise, the solvents in the Clear Coat will attack the Base Coat, and it can create the wrinkling. The Clear Coat can go on directly over the color. The Finishing solvent can also be sprayed directly on to these coatings.. All of the coatings should be applied consecutively, as quickly as possible. Under normal ambient temperatures, the time window is about 45 minutes. Higher temperatures will reduce this working time. Waiting 45 minutes or longer to apply the Clear Coat will make the Color coatings wrinkle. The retarder must also be used as the reducer for the base color coat for thinning. Against all of our recommendations, some people fail to use the QG Clear Coat. If there is no clear coat on the application, you will need to remove the color by sanding and applying a lacquer thinner to remove all of the coatings before re-applying them, correctly.. However, the MMA System or the Quick Glaze system can lift or wrinkle a previously sprayed repair. For example, it can occur when an epoxy or other unknown coating was used as the base color spray. However, both systems can work well as a touch up of a complete refinish job unless the refinish coating that was used was an epoxy, or there was no clear coat used..
A less common cause is something wrinkled under the color and the clear coats. It could have been the filler, or you sprayed over uncured resin in the FRP shell? If it is uncured resin with this level of wrinkling, the area would be soft when poked with a screw driver or sharp tool. 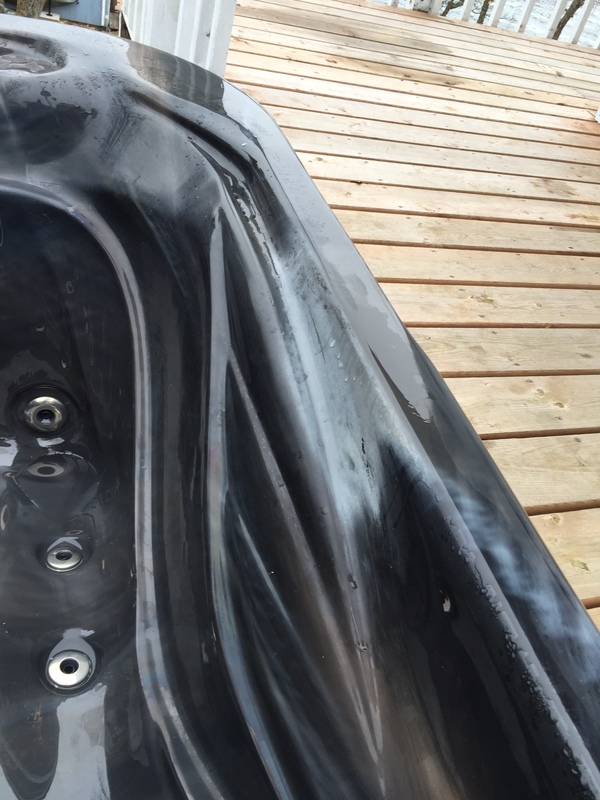 Why did a repair fade in this spa hot tub? This repair (see pics) was done about 3 months ago and is now turning cloudy. What could be the cause ? I’m thinking a reaction to spa chemicals? It is difficult to determine the exact cause of this problem without knowing some of the history and common water chemistry maintenance practices used on the spa. There are least two causes. Information on them follows. 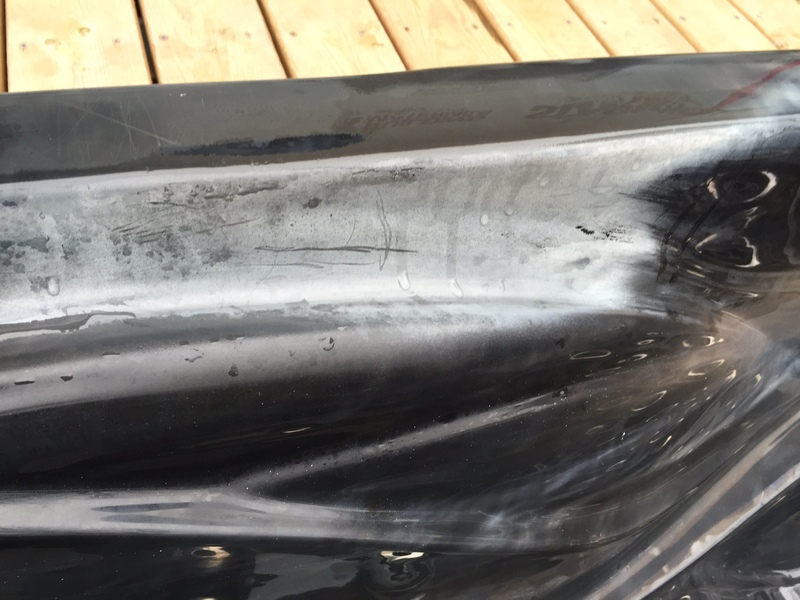 Here is information on common chemical damage to acrylic spas. I don’t suspect this to be the cause, since issues would occur at other areas of the spa – not just at the repair. The next article describes what can happen to our Clear Coat if it is exposed to moisture before complete curing – normally requiring 24 hours.. I think this is the most likely cause in your case. I am assuming you used the MTP Clear Coat to finish the repair, since we believe it is an absolute necessity to achieve a quality repair. Three months is normally the time window that post cure repair issues show up. The repair could certainly be damaged by strong oxidizing chemicals (e.g. tri-chlor). However, Tri-Chlor would also cause fading in the acrylic in other areas of the surface. So, I don’t believe tri-chlor exposure is the culprit. If the problem is simply premature exposure to water, it is an easy fix. You just need to remove the repair coating, and respray. I would recommend sanding with 400 grit sand paper to remove the top coating. Light sanding can remove the damaged Clear Coat while preserving the Color Coat. At least, it could limit the need to spray more of the Color Coat. After completing the repair, it is very important to keep the repair zone dry for a sufficient time to allow the coatings to completely cure. Exposure to any form of water may effect the coatings. If the repair was below the water line, wait for at least 24 hours before refilling the spa. This communication addresses the post-repair cure procedure, and how to place the cover to protect against water getting on the repair zone.